Using Vitamin C for Acne – Does it Work? Celebrity Skin Lightening – Who’s Bleaching Their Skin? Celebrity Teeth Whitening – Who has the Real Hollywood Smile? Meladerm Review – Is It Really That Good? Amaira Lightening Serum Review – Does It Work? Breast Actives Review – Does it Work? ProBreast Plus Bigger & Better? →Okachi Gliya Review – Facial Steaming at its Best? Okachi Gliya Review – Facial Steaming at its Best? Hi folks, Adam here once again. 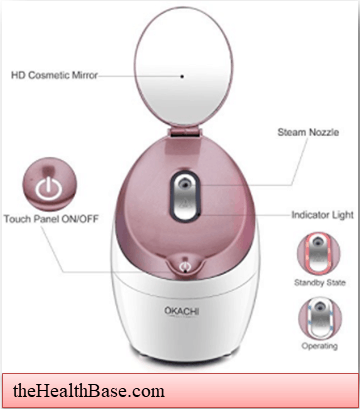 For this particular review, I will be focusing on the Facial Steamer created by the good people at Okachi. The model in question is named the Gliya and, as far as we at the Health Base are concerned, it is one of the best machines on the market today. I’m actually quite a latecomer when it comes to facial steaming. I’ve always been a fan of exfoliating via facial scrubs and the like. I also like a good sauna session or a visit to the steam room every now and again. Yet, despite this, it never really crossed my mind to put both elements together. For this purpose of this review, I will focus on such aspects as the brand reputation; the physical makeup of the machine in question; and the overall effectiveness of this product as a whole. Ultimately, the question that I am seeking to supply an answer to is simply…is this the best face steamer on the market today? Straight off the bat, it must be said that Okachi is not a world famous brand. It’s not a monster of a company in the beauty and healthcare niche. In fact, it seems to just focus on selling facial steamers. Now, this can be take one of two ways. The first way, which is slightly pessimistic and fretful, is to instantly dismiss this brands products because of the brand not being super famous. This, as I’m sure you’re aware, is premature. Just because a brand isn’t automatically a household name does not mean that it produces inferior products. This brings us to the second approach. Common sense points to this brand not being a world famous because of the fact that they only specialize in face steamers. Due to this niche being quite small and new, it makes sense that brands that specialize in this area are not household names. If anything, it bodes well that Okachi only focus on producing this type of machine – it indicates that they should be able to create quality machines. And, in fairness, they do. By only producing one type of product, this brand have carved out a nice foothold in the steaming niche. Their products come with great reviews and tones of testimonials from many different sources and wholesalers. For example, the Okachi Gliya has 166 customer reviews (and counting) on Amazon with a 5 Star rating. This is pretty stellar! As with all face steamers, there’s not a whole lot in terms of physical parts – usually there’s just the unit and an instruction manual! This is obviously quite handy as any time there is no assembly needed there’s usually a sigh of relief as well! Having to assemble something that I just spent hard earned cash on is not exactly what I’d call an enjoyable task. The Okachi Gliya possesses a distinct curvy exterior which I actually find quite pleasing on the eye. It goes without saying that everyone has different a perspective and point of view, but I personally think that the this unit is very modern and sleek in its appearance. As you may have guessed, I’m not a fan of this particular colour!! It’s quite jarring to look at. Fortunately, the other colours are a complete contrast. The ‘Golden’ model is particularly slick looking, being both understated and elegant in its design and coloring. Of course, again, it all comes down to perspective! Perhaps the ‘Christmas Red’ is the one for you!! 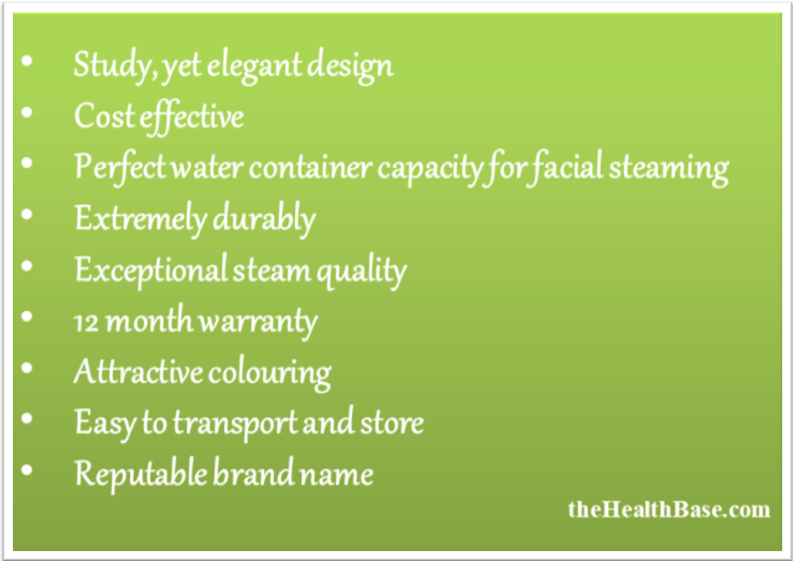 When it comes to facial steaming and a machine’s water container, there is in fact a definite size that you should be looking for. That size is from 70ml to 100ml. Any less and you won’t get a full session – such a session should last between 15-20 minutes. Any more and you’ll be left with water in your tank for no good reason! The Gliya’s container comes in at 80ml which delivers a perfect amount of mist. This means you can leave the unit running until it is empty – this will signal that you session is over rather than you having to set a timer. Important Note: It’s important to mention that if you want a machine that you can use for your hair as well as your face, then you might want to buy a model that has a bigger water container capacity. However, for a machine that’s being solely used for facial steaming, then 70-100 ml is plenty. In saying the above, an 80ml tank is still fine if you want to use your unit both for your face and hair. It would simply mean that you’d have to refill the tank in-between each session – something that takes roughly about a minute!! A personal favorite addition of mine is to add a drop or two of essential oil into the water of my steamer. This results in a far more relaxing ambiance being created as well as the benefits of the essential oil being added into the equation. For more on essential oils and how they can dramatically boost the exfoliating experience, take a look at our article where we discuss the Best 5 Essential Oils. Though I must add that if you are serious about essential oils, then you are far better off using a quality essential oil diffuser rather than a face steamer. The first thing to say on this matter is that the Okachi Gliya is very light and minute in size when compared to competing steamers. Some other models are quite bulky and heavy. This makes them a nightmare both in terms of transporting them as well as storing them when you’re done steaming. Due to this unit's petite nature, it can be transported from room to room with relative ease. Also, it can be stored in any size of cabinet. Though, and I’ve heard this from several people, because of its sleek look, many people prefer to keep their Gliya’s out on counters and cabinets! But surely this light and small design means that it can be easily damaged? Surely the durability is risked because of this design? Well, surely not! As my college described in her comprehensive guide, we at the Health Base were seriously impressed with the durability of this particular home unit. As with all our testing, we take care to give the products a thorough going over in terms of durability. Longevity in a product is of course of paramount importance. With this particular product, longevity is guaranteed. We really could not fault it in terms of durability and having the ability to last the test of time. As you can image, this is quite vital when it comes to face steaming machines. The mist has to be of the highest quality or else the entire enterprise is a complete waste of time! You may be thinking that creating steam isn’t exactly a challenging venture, and you’d be right for the most part. However, creating quality exfoliation standard mist is a different story altogether. 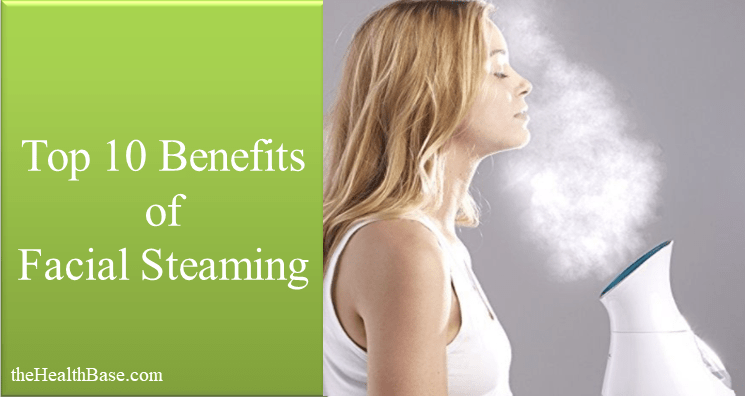 Facial steamers nowadays use Nano-ionic technology to provide the necessary top level mist. This same technology is what the people at Okachi have employed into the design of the Gliya. This results in the mist being both super fine in consistency as well as being super effective at opening up your pores. In terms of quality of mist compared to other options, I believe that this is where this machine has the edge. While it’s very hard to measure quality of steam, I found that the type supplied by the Gliya was perfect in terms of flow, heat, and overall quality. This is understandably another key element when it comes to purchasing a steam machine, or any product for that matter. Does the purchase represent a good investment? In other words, does this product deliver a good enough service in relation to its price? Whenever we decide to spend money on something, we internally gauge the cost effectiveness of the product in question. We may not even know that we’re doing this – for example, when it comes to small purchases, this deliberation could take only a matter of seconds and you mightn’t even be aware that you’ve consciously decided this particular service or product is worth the cost. For bigger purchases, this internal debate takes far longer. Now, of course there is no way to gauge the effectiveness of this home unit for yourself without actually buying it - this leaves you being left to rely on reviews and testimonials to decide its quality. Well, let me ease your mind somewhat. 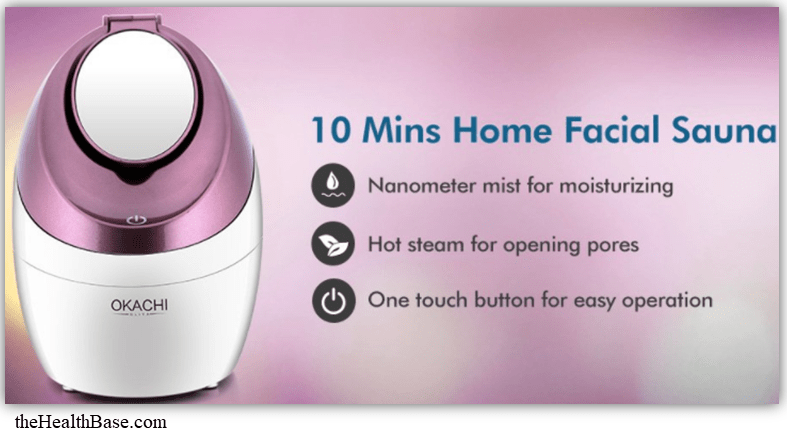 As explained with our verdict on the Gliya’s mist quality and physical attributes, we do sincerely believe that this product is a superbly fashioned facial steamer and a very reasonably priced one as well. To boot, the superb warranty that I’ll discuss further enhances the cost effectiveness of this machine. The warranty or money back guarantee is often overlooked by customers. I personally think that this comes from people mentally refusing to accept the possibility that they might buy a product that is either faulty or not what they believed it to be!! To be honest, I have sympathy for this mindset! However, despite this, it’s still prudent to ensure that your intended purchase comes with some sort of warranty. Even just for the peace of mind that it supplies. When it comes to the Gliya, Okachi supply a 12 month warranty with their produts. In reality, you won’t need more than a few sessions to gauge the quality of a steamer so a yearlong warranty is more than sufficient. In terms of durability, again, the yearlong guarantee means that you will have plenty of time to test it out and see if there are any manufacturing problems. Though, as explained earlier, this is a very sturdy and reliable piece of machinery. As I’m sure you’ve realized by this point, both myself and the Health Base team are big fans of this particular facial steamer. All of us here at the Health Base believe that the Okachi Gliya delivers exactly what anybody would be looking for in such a home machine. There are indeed cheaper machines, and ones with bigger water containers and more add-ons – as can be seen in our comprehensive guide to facial steaming. However, we do feel that Okachi model is superior in terms of mist quality; durability; and physical makeup. P.S. Please feel free to browse the rest of our knowledge base. Below you'll find some related content, or else click here for a broader look - https://thehealthbase.com/. Hey Guys! Adam here. I'm a Senior Editor for The Health Base. When not researching new and exciting health topics, I can be found in my physiotherapy clinic where I do my day to day work. If you'd like to talk to me one on one, then feel free to contact me here - I'll get back to you ASAP! Cheers! Copyright text 2018 by The Health Base. Disclaimer: Information on thehealthbase.com should not be considered medical advice, nor should it replace consultation by a qualified GP or dermatologist. Consult with your own doctor for information and advice on your specific questions. It is important to also note that thehealthbase.com is a participant in the Amazon Services LLC Associates Program, an affiliate advertising program designed to provide a means for website owners to earn advertising fees by advertising and linking to amazon.com, endless.com, smallparts.com, myhabit.com, and any other website that may be affiliated with Amazon Service LLC Associates Program.